New Jersey Gov. Phil Murphy speaks to a joint meeting of the Democratic-led Assembly and Senate in Trenton, N.J., Tuesday, March 5, 2019. Murphy unveiled his second budget Tuesday, calling for about $1 billion in increased spending that would be financed by higher income tax rates on wealthy residents and savings in public worker benefits. Murphy’s $38.6 billion proposed budget for the fiscal year that begins July 1, unveiled during a nearly hour-long speech to the Legislature on Tuesday afternoon, calls for a 10.75 percent marginal tax rate on income above $1 million, up from 8.97 percent. Guess who’s not happy about New Jersey’s new $15 minimum wage? Local governments. A Democrat elected in 2017 to succeed Republican Chris Christie, Murphy says a so-called millionaire’s tax would help lift the middle class by providing funding for priorities like education. “Those at the very top are shouldering less and less of their fair share of the tax burden. That’s the opposite of tax fairness,” Murphy said during his annual budget address in the state Assembly chamber. The plan — which represents a 3 percent increase in spending over last year’s proposal and slightly outpaces inflation — includes savings totaling $1.1 billion, largely achieved through reductions in public workers’ health-care costs, the administration says. It also allows for a surplus of nearly $1.2 billion, up from $743 million in the governor’s fiscal year 2019 . proposal. Murphy heads into budget negotiations after signing into law a measure that will raise the minimum wage to $15 an hour for most workers by 2024. He opened his remarks by blowing kisses to the audience of lawmakers and invited guests. But he has had a rocky relationship with lawmakers. 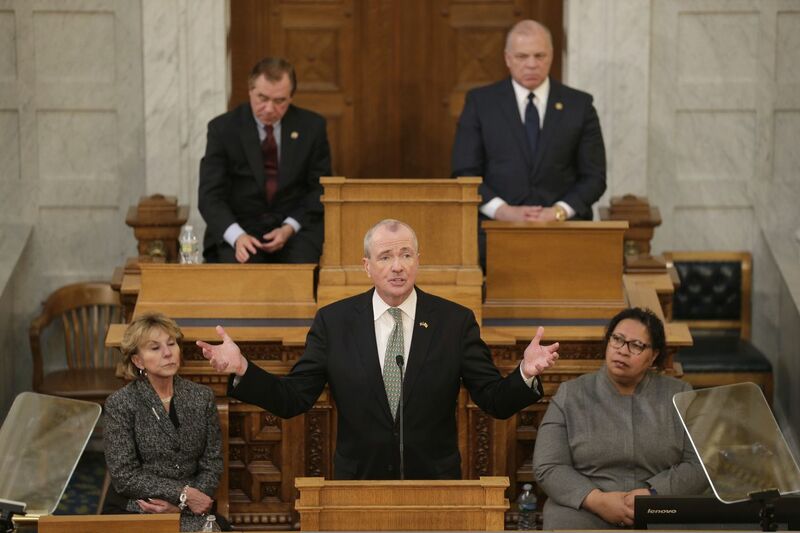 They rejected his proposed levy on millionaires last year; state government nearly shut down in July as Murphy and the Democratic-led Legislature fought over taxes. Ultimately, they agreed to raise the top marginal tax rate from 8.97 percent to 10.75 percent on income exceeding $5 million. They also enacted a four-year surcharge to the corporate business tax. The Murphy administration says the current top marginal rate applies to 6,700 people, most of whom live out of state but generate some income in New Jersey. The expansion of the top rate would apply to 18,000 New Jersey residents and even more taxpayers out of state, raising a projected $447 million next fiscal year, senior administration officials said. The tax hike could be a tough sell to lawmakers, as all 80 members of the Assembly are up for election in November. Few lawmakers could be seen standing to applaud when Murphy called for the increase near the end of his speech. Assembly Speaker Craig Coughlin (D., Middlesex) lauded Murphy’s “efforts to achieve sustainable savings” but said he opposed any broad-based tax increase. Meanwhile, Senate President Steve Sweeney (D., Gloucester) has been traveling the state to promote “major structural reforms” in state government, such as moving new hires into a “hybrid” pension system and aligning public workers’ health benefits with those in the private sector. Sweeney repeatedly pushed for a higher tax rate on income above $1 million during the Christie years, but has said that President Donald Trump’s federal tax overhaul changed his calculus because it capped a popular deduction on state and local taxes. Murphy, a former Goldman Sachs banker, faces other headwinds. As of February, 40 percent of New Jersey residents disapproved of Murphy’s job performance, up from 28 percent in April 2018, according to a Monmouth University poll. The portion of residents who approved of the job he was doing, 44 percent, was virtually unchanged. In addition, the state is facing a projected revenue shortfall for the fiscal year that ends June 30, and the Wall Street ratings agency Standard & Poor’s has warned that an influx of tax collections in April might not make up the difference. The governor’s emphasis Tuesday on health-care savings already achieved, and other efforts underway with public-employee unions, seemed to anticipate Sweeney’s push for an overhaul. The unions were instrumental in Murphy’s election, and he has been loath to pursue the big concessions from public workers that Christie and Sweeney have sought. Murphy’s budget includes $2.7 billion for health benefits, down 16 percent from his fiscal 2019 proposal, the administration says. He also seemed cognizant of GOP efforts to tag him as a tax-and-spend liberal — a label that helped sink former Gov. Jon Corzine, who sat in the front row Tuesday. “We must remain vigilant to safeguard” the surplus, he said. Republicans were skeptical. “Even if the governor’s rosy projections — of both revenue and savings — are accurate, we are still only a fraction of the way out of the hole we’re in," said Sen. Declan O’Scanlon (R., Monmouth). Murphy proposed a $3.8 billion contribution to the pension system for some 800,000 active and retired public employees, which would be the largest payment in state history. His budget also includes an increase of $206 million in formula aid for public schools and an additional $86 million for pre-K expansion. Total school aid — including pension payments and school construction debt service — would be $15.4 billion, up from $15 billion last year. Murphy wants to boost, by $25 million, direct state aid to NJ Transit and allocate $100 million to fight the opioid crisis, via increased fees on manufacturers and distributors of the drugs. The governor also proposed $238 million for the popular homestead program, which provides local property-tax relief for moderate-income households, seniors, and the disabled.